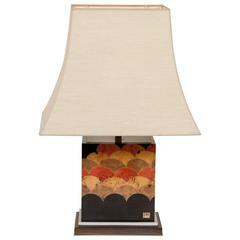 Late 20th century pair of Fornasetti Farfalle butterfly table lamps, Italy. Beautiful lamps as shown in photos. The iconic enameled butterfly design with brass details. Shades not included. Measures: 13 inches high to the top of enamel 25 inches high to the top of the shade 5 inch diameter. beautiful vintage condition with no issues. natural oxidation on the brass as shown in photos. 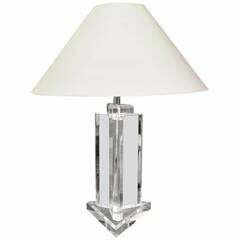 Late 20th century Lucite lamp, three columns on triparte base. A handsome late 20th century rectangular lamp having disk motif decoration on a black lacquer base. Midcentury Italian designer table lamp with three lightbulbs and a foldable black metal case. For the electrification we assume no liability and no warranty. Italian chrome table lamp with a chrome/brass base. 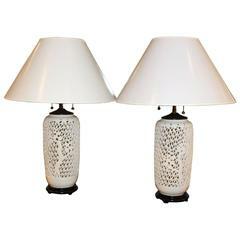 Pair of late 20th century reticulated white porcelain lamps on hardwood bases. Chinese, circa 1960-1970.